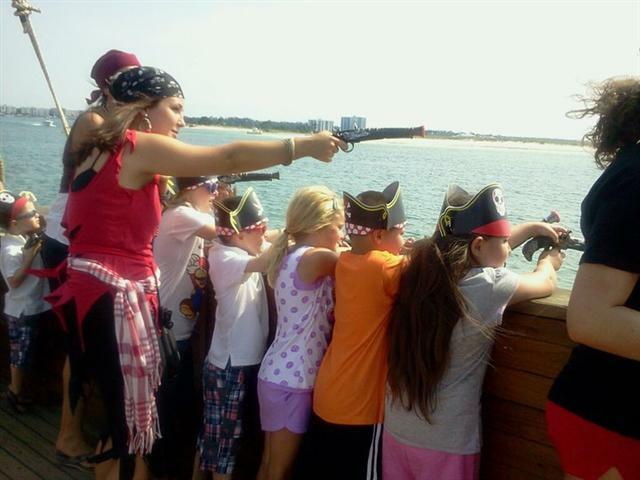 Your child will experience a fun and eventful battle at sea aboard the American Star Pirate Ship Adventure in Orange Beach, AL! 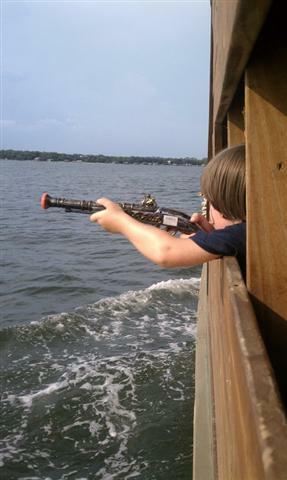 Guns will be provided for use on the boat, but will remain on the boat at the conclusion of the trip, for all children to use. As we cruise the waters of Orange Beach, Gulf Shores, and Perdido Beach, we will battle 'enemy' pirates who are attempting to find our gold and treasure before we reach it! Also, learn about ambush attacks against these 'enemy' ships to prevent them from boarding our vessel. Your little matie will learn about ship terminology. The front of the ship is known as the bow. As you venture to the rear of the ship, you will be in the area known as the stern. If you stand with your back to the stern of the ship, and face to the front of the vessel, you will then be ready to learn about the port and starboard sides of our Pirate ship! We have your little matie stick out their left arm to indicate that they are then pointing to the port side of the vessel. Port is easy to remember since it only has four letters, just as left only has four letters. Once that is established, we will stick out our right arms! Our right side indicates that we are pointing to the starboard side of the vessel. Starboard has more than four letters, just as right has more than four letters, so this is an easy way to remember the areas of the boat! Listen up as the mates on board and the captain will announce whether the enemies are located on the port or starboard side! Watch your little mates run around from side to side attacking boats as they are passing the ship. Participate in various ambush attacks throughout the cruise along the waters of Orange Beach, Gulf Shores, and Perdido Beach! Beware of various water cannon attacks from other boats as well, and help the captain be aware of any potential enemies at bay.